Wear an intricately crafted piece of gold Celtic Jewellery, which has been made by an Irish master craftsman. Irish Jewellery is symbolic in nature with many of the pieces created directly relating to old artifacts, Irish mythology and old Celtic spirituality. Nowadays, large numbers of people wear these beautiful pieces to commemorate their Celtic heritage, or to show the origin of their family tree. In every way, the Celtic designs are beautiful to observe, the craft is exquisite and the meaning is fascinating. Throughout the years, the demand for gold Celtic jewellery has increased and as a result, we continue to provide our customers with superb pieces of hand crafted Irish Jewellery. The Gold Celtic collection includes ladies necklaces, earrings and beautiful Celtic Crosses. The array of Celtic jewellery includes beautiful Irish designs such as the Claddagh symbol, the Saint Bridget's Cross, Shamrocks, the Trinity Knot and the Celtic Cross. All of these beautiful Irish crafted designs effortlessly celebrate the Irish Celts and their way of life. The detailed artwork on each item is impeccable in every aspect. Our Irish jewellery collection comes in 9kt or 10kt white and yellow gold and many of the items bear emeralds and dazzling diamonds. The items also include multiple different styles. The necklace can come as one or as a pendant and chain. The earrings are studded but we also have many drop set earrings. The Celtic Crosses are available in various sizes and styles. Our array of Irish jewellery has something for everyone. If you are looking for a gift for yourself, your partner, a family member or a friend, Irish jewellery has everything you need. Claddagh Jewellers are the suppliers of the Authentic Claddagh Ring™. 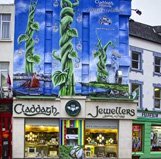 We have made and shipped mass amounts of Irish jewellery all over the world since the launch of our first website in 1998. We continue to grow strong and are trusted worldwide for our exceptional customer service and our attention to every detail.